Hiking, biking, climbing reviewed by Las Vegas Visitor - insider reviews of restaurants, casinos, attractions, and online shopping for Vegas collectibles. We started out with a list of locations close to Las Vegas. We then realized there are spots around Las Vegas within a day's drive that might be attractive to some of our visitor from out of town. Most of these locations are quite unique. I think the average visitor would be quite surprised to see them. Monument Valley comes to mind, but that is really a far reach. From Las Vegas you can do what we locals call the Grand Circle Tour., which takes you to Zion, Bryce Canyon, Capitol Reef, Arches and Canyonlands National Parks. Canyonlands is by far the largest, most rugged and consists of three different sections, each unique in it's on right.The sections are Island in the Sky,the Maze, and Needles. you could go there year after year and literally not see it all in a lifetime. Take it from me, I have been there, done it, got the T-Shirt. I also like Arches a lot. There are an astounding over 2,000 of them. Most are inaccessible, but the ones you do see are worth the entire trip. The trump card for that state is the Grand Canyon. Let me say something right from the beginning. The canyon is huge, immense, other worldly. Words are inadequate to describe it. It must be seen in person. There are three different ways to visit the canyon. Although the Grand Canyon is not the deepest, (that one is in the Himalayaqns), nor the the widest (that one is in Australia), it is the longest, most accessible and most scenic and well known. We have the North Rim, South Rim and West Rim. Drive yourself, by plane or by bus. The easiest from Las Vegas is the West Rim which can be seen in a days drive. The South Rim is about 280 miles by car. The North Rim is farther, is at about 8,000ft elevation and can be reached in the summer months only. It is not advisable for folks who suffer from breathing problems. Let me give a brief description of some of the more popular hiking trails and view points. Hermit Road. West of Grand Canyon Village. About 8 miles long. Closed to private traffic except for December, January and February. During those months it is ideal bicycling. Those months are also the ones when poor weather can be expected. Hermit Trail. Not to be confused with Hermit Road. Close to 10 miles. Go down the Hermit Creek drainage to Granite Rapid. There is a Hermit Creek campsite, should you want to camp. Rim Trail. This trail runs for 7.5 mile between Grand Canyon Village and Hermits Rest. Mostly level and suitable for families.The section between Powell Point and Monument Creek is dirt, the rest is paved. View Points Along the above trails. Hermits Rest, Pima Point, Monument Creek, The Abyss, Mohave Point, Hopi Point, Maricopa Point, Trailview Overlook. Desert View Drive. About 25 miles, ends at the East entrance. You can use your private car, the shuttle ends at Yaki Point. Here are some of the interesting stops: Greenway Trail, to the visitor center 1 mile, to Yavapai Point one half mile. South Kaibab trail, Grandview trail, drops 2,600 ft. over 3 miles to Horseshoe Mesa. No water, carry it in or do not go at all. You will not make it back during the summer without it. New Hance trail, 6.5 mile to the bottom. You find this trail 1 mile west of Moran Point. Park right there, the trail head is at the no parking sign. Again, do not attempt this trail unless you are very experienced, are in good shape and can carry lots of water. This is a very difficult hike, as are a lot of them in the Grand Canyon. I am giving everyone a heads up about it.Tanner trail, east of Lipan Point. Drops down to the river in about 9 miles. Even more challenging than the previous trail. At the bottom you can camp at Tanner Rapid. Interesting stops along Desert View Drive are: Yavapai Geology Museum, Grand Canyon Visitor Center, Tusayan Ruins/museum, Yavapai Point, Mather PointMather Amphitheater, Pipe Creek Vista, Yaki Point, Shoshone Point, Grandview Point, Moran Point, Lipan Point, Navajo Point, Desert View Watchtower. Running the River Running the river is extremely difficult and dangerous. There are no less than 160 rapids that are so difficult they have their own rating system. Normally a whitewater river is rated on a scale of 1 -5. The Colorado is rated 1 - 10. So, it behooves you to hire experienced guides/outfitters. If you want to try it on your own you need to enter the yearly lottery. $25 for a once yearly permit fee plus $100 per person. Go to mygrandcanyonpark.com/resources The river season runs from May to October. If heat bothers you do not book a summer trip. Temperatures run in the triple digits. 115F - 120F is not uncommon. The North Rim is an entirely different cup of tea. It is hard to reach, and elevations go up to 9,000 ft. This is not for everyone. People with any kind of breathing problems should definitely not try this, unless they carry a breathing apparatus.This area is open from mid-May - to mid - October.It can be reached via AZ 67, 45 miles south of Jacob Lake. There are a few trails that are interesting, but very difficult because of the extreme elevations. I have a small list of them here. A few of the vistas at the rim are Bright Angel Point, Point Imperial (11 mile drive from the visitor Center) Good views of the Vermillion Cliffs and Marble Canyon. Cape Royal is a 25 mile drive and a half mile hike. It gets you to Cape Royal Point and a view of the river from far above. Point Sublime.You need a 4 wheel drive to get there. It is 17 miles on a bumpy dirt road. Access is off AZ 67. Transept Trail 3 miles (return). Viwes of Bright Angel Canyon and Bright Angel Point. Widforss Trail 10 miles round trip. A pretty long hike at that elevation. Good views of Wotans Throne, Brahma Temple and Zoroaster Temple Find the trail head a quarter mile south of cape Royal Rd. Cape Final 4 miles round trip, but fairly level.Good views from the top of the Walhalla Plateau. North Kaibab Trail to Roaring Springs You must be in good shape for this one. About 9.5 miles round trip with a change in elevation of 3,000 ft. It is dramatic, but difficult. This comes as a big surprise to a lot of people. West Rim, they say, never heard of it.But, from Las Vegas that part of the Grand Canyon is the easiest to reach. Very accessible and convenient. Just head your car south on I93/95. keep going on I93 past Boulder City and Hoover Dam in the direction of Kingman. Before reaching Kingman you will see a sign pointing to Dolan Springs. Take that road, past the old Grand Canyon Ranch, and after a few miles you will reach the entrance to the West Rim. The land you enter is actually an Indian reservation. They want an entrance fee. The road ends in a huge parking lot. From there you have courtesy buses taking you the rest of the way. The famous glass bottom canyon over look is located here also. It charges a separate fee, but overs an amazing view of about 2,000 ft. straight down. People have had anxiety attacks on it. From For more information, brochures etc. shoot me an email at webmeister@lasvegasvisitor.com. Let me know what you are interested in. The brochures are free, the mailing charge is not. From Las Vegas you can also visit a few ghost towns in California, Nevada, Arizona. Jerome, Rhyolite, Oatman, etc. come to mind. They are very suitable for hiking and exploring. I have actually been to all of those myself. There are a few really historic trails/roads in the U.S. The Natchez Trace comes to mind. But none evokes those romantic notions of exploring the U.S. by car as Rt. 66. After all, it was really the first regular, paved, long distance U.S. highway. Here are a few hints as to where to start when you are in Las Vegas, NV and have a few days to spare..
Let me start it all off with this little gem of a town. Boulder City was originally a company town built to house the workers who constructed the Hoover Dam. Many of the original buildings remain and are still occupied to this day. The city was laid out by a Dutch landscape architect ( my compatriot). There are many, many trails in Boulder City and environs that are suitable for just about any outdoor sport imaginable. There are trails for hiking, mountain biking, off road racing, quads, etc.etc. There are four zip lines that come off the mountain. Some of them reach speeds of up to 60 miles. Let me mention here a few of the more noteworthy trails and how to reach them.
!) 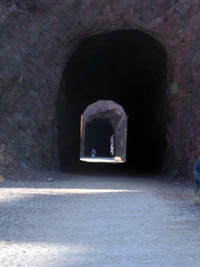 Railroad tunnels. There are five of them (tunnels, not trails). 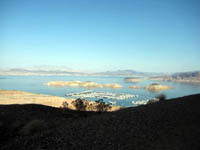 You access them at the trail head below the visitors center of Lake Mead. The end of the trail is the top floor of the parking garage at Hoover Dam. To get there take the I93 from Boulder City, turn off at the Lake Mead Visitor Center turn-off. Drive about one mile and you will spot the parking lot on the right. From there just follow the signs.Parking is free, so is the hiking. 2) Lake Mountain Trail. This trail can be reached from Henderson, Boulder City, Railroad Pass, Lake Mead Blvd. in Henderson and points in between. Easy to ride and hike because it is "mostly" level and it is paved. This trail is very long. and goes all around the mountain range in Boulder City and along lake Mead.There is no charge to use this trail. 3) The zip lines can be reached by following the signs on the highway. A bit pricey, I think fees are in the hundred dollars and up range. 4) Mountain bike trails are too numerous to enumerate here. Just follow all the signs that are posted in B.C. They are very hard to miss. 4) B.C and Lake Mead also host Iron Man contests. ....If you want some more information on all of this send an email to webmeister@lasvegasvisitor.com There is a small shipping charge. 5) Turtlehead Peaks. In Red Rocks. A four mile hike that is quite difficult and not for the beginner. 6) Brownstone Canyon. In Red Rocks. Also very difficult and about five miles. 7) La Madre Springs. 2.5 miles or a five mile loop. Quite doable for most anyone. This is Red Rocks again. 8) Mary Jane Falls, Spring Mountains.fairly easy, about three miles. 9) Big Falls. Spring Mountains. Very difficult, but short, two miles. 10) Spirit Mountain. As you drive towards Laughlin on the 95 S at Christmas Tree Pass. This is a difficult three mile trail, but it can be reached by car. When you drive through the little mining town of Searchlight don't forget to stop at the small casino. You may run into Harry Reid, Senate Majority leader. He is from there and often is in the casino having lunch or breakfast. You will not see him drink, Harry does not drink alcohol. 11) Fortification Hill. A few miles (about fifteen) south of Boulder City, on the east side of Lake Mead. A very strenuous hike. To get to the trailhead you need to drive across the river on Highway 93 and take the Kingman Wash Road to get to the trailhead. This hike provides absolutely no shade at all. Take water, sun screen and make the usual preparations for a desert hike. The trail itself should be about a 4.5 mile roundtrip. I recommend taking a "Alpenstock" (hiking pole). Two of them would be even better. There are many more nice trails around Las Vegas. We will add them as soon as we check them. The crater is located in the Mojave National Preserve. Drive down to Kelbaker road until you reach old route 66, the original highway of the U.S. The Amboy crater is an extinct volcano. This section of route 66 sees very little use. There is also a town by the name of Amboy which now strongly resembles a ghost town. After route 40 was build, route 66 lost most of its traffic and business. When the railroad (Southern Pacific) laid tracks between Needles and Barstow it also built watering stations and depots, all named in alphabetical order, Amboy, Bolo, Cadiz, Danby, Essex, and so on. I suggest a visit only if you have the time and inclination to see a dying section of the U.S.
Slot canyons are very narrow canyons that are immensely popular with hikers and rock climbers. This particular one is easy to reach and easy to hike. It is about one third of a mile in length. Be very careful about the weather forecast, do not enter a slot canyon if there is the slightest chance of rain. At Black Mountain. I had my fill of that trail. It takes you to the mountain with all those TV antennas. Pretty rough going over rocks. Bike tours of Red Rock Canyon and several other destinations. Rental bikes available. For brochure: webmeister@lasvegasvisitor.com. A small shipping charge applies. This peak is in an area called "Cold Creek". It is well over 10,000 ft. in elevation. Most folks go for the wild horses in that area. Seasonal bird watching is popular also. Take US95 north. Turn left at the correctional center onto Cold Creek Rd. Follow it to the end . Just like the name says, bootleggers used the area during construction of the dam. Take I93 south into Boulder City and follow the signs. Lots of good trails in the area. This is the highest peak in Nevada. Not the prettiest, not the most scenic, just the highest. Not even a footnote for mountain climbers. Nevertheless, it's elevation is about 13,000 ft., too much for the average hiker. The problem is the neighboring peaks are taller, but they are all in California, at the White Mountain range. The odd thing (one of many odd things in Nevada) is, that the peak was originally in California. A 1870's land survey placed it in Nevada, Esmeralda county. That survey became known as the "von Schmidt" survey. The survey itself was the result of a nasty boundary dispute around Lake Tahoe. The von Schmidt survey and boundary line was disputed and only twenty years later a new survey moved the state line 20 miles west again.There is a von Schmidt boundary monument, I believe it is around Needles, Ca. near the Colorado River. Not to be mistaken for the "Valley of Fire". Similar names, different experience. The Bowl if Fire can only be reached via a fairly difficult hike and lies off the Northshore Road in the Lake Mead National Recreation Area. Not too far from the Strip really, but like being on a different planet. The hike is about 2 miles give or take a 1/4 mile. You may encounter the "Mojave Green Rattler", one of the most poisonous snakes in the U.S. So, wear the appropriate hiking gear and check where you put your hands while rock climbing. Take your cell phone. If that rattler hits you there are only minutes to get help. After that it is all over. Luckily most strikes are dry, no venom is released. A little bit too far for a day trip. If you have the time those locations are a wonderful jumping off point for a host of natural wonders.We just list them to give you an idea. If you are interested we can send brochures. Brian Head has good skiing, but I think the lodge is at 10,000ft, that's not for everyone. Zion National Park. Absolutely wonderful. I visit there as much as I can. Grand Staircase of the Escalante. That one I belief, is in the so called "Arizona Strip" which is hard to reach. Bryce Canyon. I have made several trips to that one also. Coral Pink Sand Dunes. Amazing. So, should you be in the mood for a bit of sightseeing, than head North on the I15. 172 miles from Las Vegas. Remember, here in the West is no such thing as a "short" distance. A monumental piece of "Land Art" in Garden Valley, near Hiko. 1.25 miles long, a quarter of a mile wide. Michael Heizer, the artist, has been working on this for better than forty years. Must be seen to be believed. Hiking, survival skills, desert survival, trips and more. At the Desert National Wildlife Refuge. About 50 miles north of Las Vegas on the U.S. 95. Turn off at Corn Creek road. Plenty of hiking, birding and sight seeing. Like many other Nevada preserves it is huge. It has over 1.5 million acres. Take the Blue Diamond Rd. (Rt.160), turn off (left) at Castalla St. It is at the foot of Mt. Potosi. Lots of trails. This is an iconic destination. Those tales of lost wagon trains, unbearable heat, lack of water, movies, cowboys, bad boys and good men. And then there was Ronald Reagan, our former president, in a television series (Death Valley Days). About a three hour drive from Las Vegas. Check in at Furnace Creek for maps and information.There are amazing things to see and do. Start with Badwater, for instance, the lowest elevation in the U.S., 282 ft. below sea level and as flat as can be. The clear air makes it appear as if a mountain that is many miles away is right in front. This is generally true for all desert areas in Nevada. Death Valley is not really in Nevada, but in California. Another strange thing about Badwater, from the lowest point in the U.S. you can see one of the highest points in California, Telescope Peak, 11,000 ft. above sea level. Other note worthy places are the Devil's Golf Course and that strange place where large rocks move across the desert without any help from humans. Really strange. This colossal piece of "Land Art" can be found near Overton. Michael Heizer, the artist, used earth moving equipment to displace 244 000 tons of rock to create it. He also created "City" which is even larger (1.25 miles long). This area is not in Nevada, but in California, but it more or less borders Nevada. It can be reached by the I15, or the I95. going south. There is not much left of the old fort, just foundation stone. It is located within the Mojave National Preserve, a huge desert area (everything here in the west seems to be over sized). It was built in 1867 by Company D, 9th U.S. infantry to protect the Mojave Road, linking California and Arizona. Oddly enough it was abandoned only a year later.The Mojave Road itself was used for many years later because water was available at the site. This also was a long time camping site for the Mojave and Chemehuevi tribes who lived here for many centuries. Artifacts can be found all over the desert in this area. About 100 miles south of Las Vegas. It sits on I95 about 30 miles past Laughlin on the Colorado River. Really nice during the winter. Temperatures are 5 - 10 degress warmer than in Las Vegas. Their main attraction is London Bridge. It was bought in London, England, dismantled and rebuilt here. Do not mistake this for the Tower Bridge. That one is still in London. A really stunning adventure, but too far for most visitors, it is about a 300 mile trip one way. If you have the time, find your way to Page/Arizona and take it from there. There are a myriad things to do, slot canyons, water, beaches, natural beauty galore and the largest natural stone arch in the world. This is a strenuous eleven mile hike. North from Las Vegas on Route 395 about 50 miles. take either the Lee Canyon or Kyle Canyon turn-off. Lots of good climbing, hiking, and dirt biking. There is a small hotel in Lee Canyon. Farther up is a nice lodge. They sometimes have a German band. Very noisy but gemuetlich. If you are in Kyle Canyon and you want to try Lee Canyon there is no need to travel back to the main road. They are connected by a nice, well paved road. Northwest of Lake Mead. Great hiking area and a slot canyon. For this one you should be in good shape or try another hike. The end of the trail offers great views of the Bowl of Fire sandstone formation. Remember, this area and the Valley of Fire may sound the same, but they are very different hikes. At over 5,000 acres this is not a small place. It is situated close to the small town of Alamo, a ranching community. The refuge is part of the Pacific Flyway (Alaska-Canada-Mexico), for migratory birds. Over 300 species have been recorded here. It includes the huge greater Sandhill crane. There are several lakes and fishing opportunities. Beaver, coyote, mountain lion, kit foxes have all been spotted here. So, if you are a birder get over there. Early November would be the best time. This location is really in Jean NV, about 30 miles south of Las Vegas. You can take the I15 S. or, if you want some fun go south on Las Vegas Blvd. You can't miss it, there is only that road or the I15. For brochure: webmeister@lasvegasvisitor.com. A small shipping charge applies. Is actually part of a huge desert or semi arid landscape that stretches from the Canadian border well into Mexico. Visiting the Sonoran desert from Las Vegas is only possible if enough time is available. The jumping off point would be Tucson, which is situated just North of the Mexican border. A visit to that desert is well worth it though. We know that type of landscape from countless Western movies. The tall Saguaro cacti which are iconic, the dry desert, the summer heat, the Indian (Apache) uprisings, the U.S. cavalry chasing bandits etc. Not far from Tucson lies the small town of Tombstone, made famous because of the "gunfight at the OK corral. Several movies have been made on that subject. I think I have seen them all. In Bootleg Canyon, Boulder City, NV.These are badass, speeds of up to 60 MPH. Four separate lines. You won't quite be able to see Russia, but you will see Las Vegas.. For brochure: webmeister@lasvegasvisitor.com. A small shipping charge applies. The West Rim From Las Vegas take the I93/95 S. to the Hoover Dam, through Boulder City. Continue across the bridge towards Kingman. Some miles down the road you will see a road sign pointing towards Dolan Springs. Take that road, it goes directly to the Canyon. Be aware that the West Rim is on Indian Land. Entry fees will be levied. But the trip and the fees are well worth it. You will pass a real old ranch the Grand Canyon Ranch, that was settled years ago. Looks like a scene out of the Old West. The road is mostly in good to very good shape, The biggest attraction at the West Rim is the glass bottom viewing platform that hangs over the canyon at about 2,000 ft (or more). People have been known to get sick of fear on it. Beware the gift shop. The bulk of the items is made offshore, mostly in China. If you want authentic stuff (and I think you should), you should visit the smaller building. It has the authentic, native American stuff. 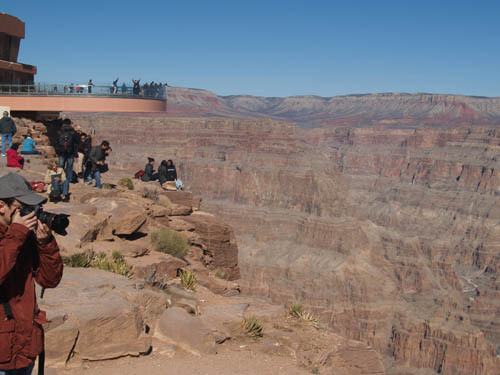 The picture shows visitors on the SKYWALK overlooking part of the Grand Canyon. I say part because the canyon is immense in its dimensions. Some 300 miles, if memory serves. If you are a glutton for punishment you are at the right place. Take the 215 and exit at the Lone Mountain exit. The trail is less than a mile, but gains almost 800 ft. In Henderson. A complex of well maintained, multi use, hiking trails. One of three mountains I know of with the same name. And they are all connected with mining. The one in Bolivia has been mined for three hundred years now.It is known as the mountain of silver. Another is in Spain. The one here in Nevada had lead mines. Take I15 south, turn off on route 160 west, then take the Boy Scout Camp Rd. turn off. This mountain is locally famous because here is the location of a plane crash (1942) that took the life of Carol Lombard, wife of Clark Gable. Some wreckage is still there. At the Red Rock NCA. Not for beginners, the weak,and couch potatoes. Do not under estimate the difficulty. It is an eleven mile hike, over rocks and through brush, over rocks, and you need to carry plenty of water. And there is relentless heat or cold. The trail head is at First Creek. At Mt. Charleston. Take the North Loop Trail up to Raintree. Signs will point you to the spring with the fresh, potable water. It is about a one half mile hike. Take I-15 going North about 10-15 miles from downtown. Just on the other side of Nellis A.F.B. Take your dune buggy, bike, motorcycle, whatever. It is great fun. For me anyway. At Mt. Charleston. For those of you who are able to complete the Trail Canyon hike. I suspect not too many. At the end of Trail Canyon is the start of the North Loop. I wish you good luck. The elevation is amazing. Bring oxygen. At Mt. Charleston. Here we have something pretty amazing. A tree that is older than the U.S., older than Rome. It is in fact a few thousand years old. Take the North Loop trail. The hike is about six - seven miles. Take the Blue Diamond turn-off. That will take you to Red Rock Canyon. Lots of real climbing there. Hiking good here also. Take the Blue Diamond turn-off. That will take you to Red Rock Canyon. Stay on the paved road for your road bikes. The trails are good for mountain bikes. There are good mountain bike trails in the small town of Blue Diamond just off State Route 160. As you travel west on 160 watch out for turn outs and parking lots. That is where the mountain bike trails are. Most of them are marked. Go to Boulder City, 25 miles east. They have lots of mountain bike trails. Some of them are difficult. Take either W.Charleston or Blue Diamond Rd. to access the Red Rock loop road. Take the Calico Basin turn off and follow the signs and take the boardwalk to the natural spring. Some miles south of Las Vegas. Take St. Rose Pwy. It is best to drive south from the Henderson Executive airport drive until it changes into Via Inspirada, then Bicentennial Pwy. Turn right on Via Firenza. left on Savella and back onto Via Firenza, righ on Democracy Drive (not paved), then left on Nawghaw Poa Rd. There is a visitor contact station at the end of that road. Better check before starting your trip. There is a lot of construction in Henderson, and things change all the time. Sloan Canyon is famous for the over 1,000 petroglyphs that decorate the walls of the canyon. To get there requires a long ride over a bumpy, dusty road. It is at Mt. Charleston. Stay away, unless you are in good shape. It is the elevation more than the difficulty, although this is not an easy trail by any means. It starts at almost 8,000 ft. and rises to almost 10,000 ft, give or take a few hundred. An ambitious 115 mile project around the perimeter of the Las Vegas Vally. It is slated for completion in 2027, if then. About a dozen different agencies and non-profits are involved in planning and funding. That's what a lot of people think of Nevada. Nothing but a big pile of rocks, sand and brush. But there is much more to it than just that. Crystal clear skies, no flies or mosquitoes to speak of. endless vistas, ghost towns (about 10,000), scattered ranches, small settlements. In short, the desert has a certain charm that is different from other landscapes. 1/4 mile - 45 minute daily tour to Lake Harriet and the 1860's blacksmith shop, the second oldest building in the Las Vegas valley. Here is some fun for the entire family. It is really close to the strip and, above all, it is different. Whoever suspects all that water in the desert? And the plants, and the birds, and the flowers? Take Tropicana East and continue on Wetlands Park Dr. to get to the main entrance. There are other ways to get there, but this is is the best. I guarantee you will be surprised. I estimate the distance to be about ten miles from the strip. From Henderson take I93. Take the Lake Mead turn off at the visitor center. Remember, the Lake Mead area is a fee area. Proceed to the 33 Hole Overlook, and park in the first lot on your left.Take the trail and keep you eyes open for owls. You need to squeeze through a narrow slot to get there. Don't do it when rain is in the forecast. You will encounter two large pipes that go under Lakeshore Drive. You can go through them. It is a nice hike. At the Red Rock National Conservation Area. Take the Red Rock Scenic Loop for about seven miles, turn off at the Willow Springs turnoff. The Parking lot is on the right hand side. You did not know you are close to Zion when you are in Las Vegas, did you? Well, you are. Drive North on the I15 to St. George, Utah. From there it is a short distance to Zion National Park. I like it a lot, have visited several times. St. George itself is real pretty also. Mormon country I would say. Real nice folk, accommodating and friendly. The main drag is really picturesque.